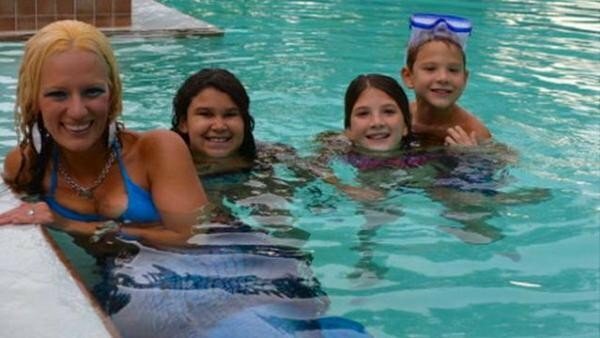 Some of you may have already read the recent article about the mermaid in Florida who got kicked out two of the local public pools. Jenni Conti, whose mermaid name is Eden Sirene, lives and swims as a mermaid in Fishawk, Florida. She wanted to swim at the Fishawk Ranch, where she’d previously been before with the okay of the staff. But this time she got the boot, citing safety concerns. The pools both have no fin policies, like many public pools, usually including snorkles, foot fins, and other non-approved floatation devices. Patrons have surrounded her with support, while others have criticized her for wanting a special favor. Conti insists she just wants a chance to swim with the kids, who of course find her delightful. Her real dream is to swim at the Florida Aquarium. Conti, a mother of a son, has only been swimming with her fin for about a year. Seven years ago she had a brain tumor and lost the use of her legs. She had to relearn how to walk. When she saw mermaids at a renaissance fair she attended last year with her 10-year-old, she knew she had a future as one. Conti says many people have encouraged her, and parents have extended invitations to her to swim in their pools. She plans to eventually charge a fee for private parties but prefers to not charge families–this is why she likes to swim in public pools. “To just swim with the kids, it’s supposed to be for everybody,” she said. The silicone tails are for sale at many online retailers and have become increasingly popular over the last few years. There is even an annual Mercon where mermaid performers both professional and everyday folks gather to make a splash in the pool at a Vegas area hotel. Many mermaid performers use their skills of swimming stealth to generate cash, but dedicate themselves to higher causes like crusade for cleaner oceans. Hannah Fraser is one of the most famous, and is featured in the book The Next Eco-Warriors. Do you think Conti should be allowed to swim in the public pools? This entry was tagged Among the Mermaids, Eden Sirene, Fishawk mermaid, Hannah Fraser, Jenni Conti, mermaid kicked out of pool, Varla Ventura. Bookmark the permalink.